Neurons are a lot like electrical wires. 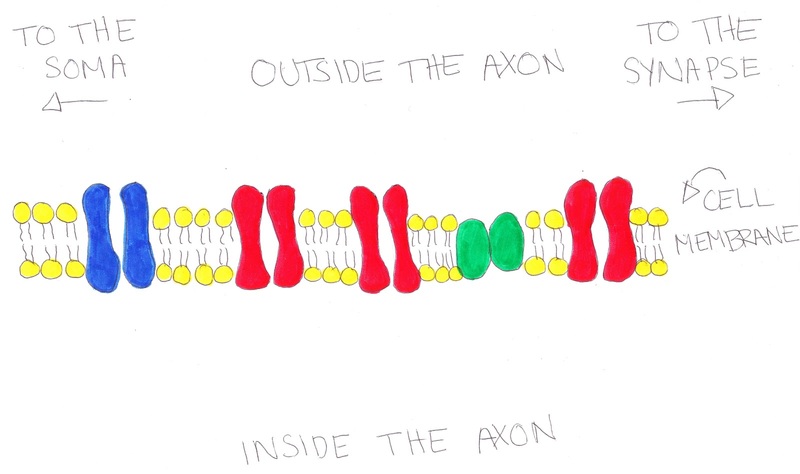 In fact, the axons are electrical wires. As you’ve no doubt noticed, electrical wires are fast. As I type, words pass through my computer to appear on my monitor the instant my fingers press down the keys. That’s pretty darn fast. Your brain has to be fast, too. If you encounter a slobbering lion, your eyes need to tell your brain to tell your muscles to run, now, or be tasty lion lunch. If you put your hand on something hot, you need to pull it off before you burn. The point is, your brain has to be fast. And what’s one of the fastest possible ways to transmit information? Electricity. Under normal circumstances, the ions are stuck where they are, because they can’t cross the fatty cell membrane. See the red and blue things in the picture? 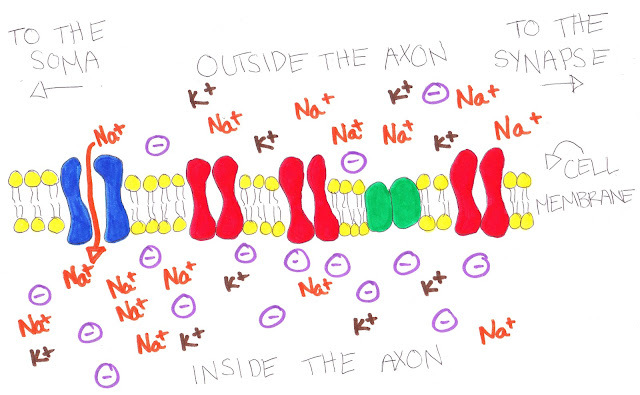 These are ion channels. They’re like doors across the membrane that only ions can use, but they’re almost always closed. Now, let’s say something happens. Maybe you step on something sharp. Maybe you see two people fiercely sword fighting on top of a red hot air balloon. Maybe your friend ate too many beans and now something smells awful and you need to get out of the room or suffocate. The point is, there’s a stimulus. Something important that your neurons can respond to. The stimulus sets events in motion. The stimulus does this by opening one of those ion channels. In our picture, the stimulus opens the blue ion channel, which is the closest channel to the soma. As each section of the axon gets more positive, more and more voltage-gated channels open, each one further from the blue channel than the one before. 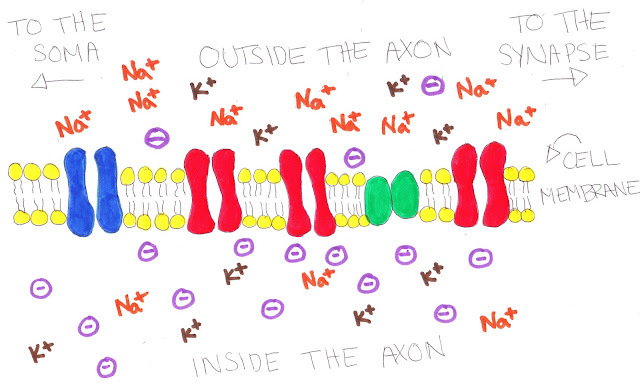 Once it starts, it doesn’t stop until the positively charged message travels down the whole axon. Eventually, the action potential does stop. When the cell gets too positive, other voltage-gated channels open, which allow potassium to leave the axon, making it negatively charged again. There’s also pumps (the green things) which dump out all that excess sodium and maintain the neuron’s normal, negative state. 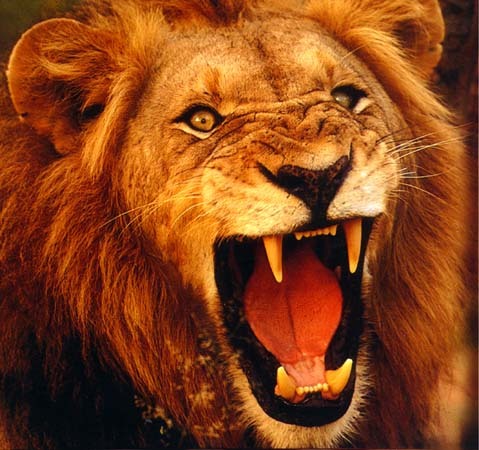 Once the membrane potential is reset, a new action potential can fire the next time you see something interesting (like the hungry lion’s hungry sister). Action potentials range in speed from 1 meter per second to 100 meters per second. 100 meters is the same as 328 feet, which is longer than a football field. That means that in one measly little second, an action potential can travel farther than an entire football field. Since you are a whole lot smaller than a football field, this means that things in your body can happen really, really fast. 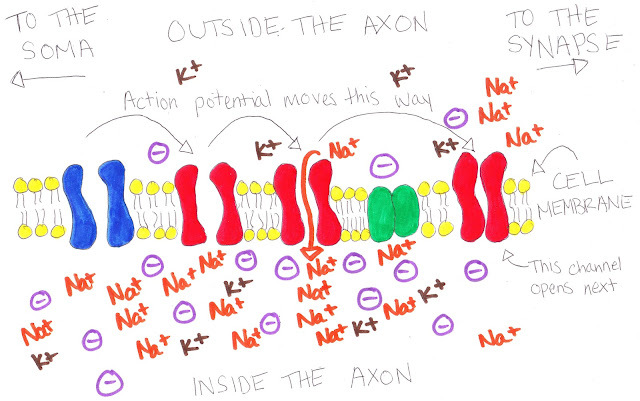 Once the action potential is complete, the message needs to be transmitted to the dendrites of the next cell in line. This happens at the synapse. A post on this is coming soon. Such a shame that Blair gets no feed back on her remarkable brain blog. Hope she doesn't stop pposting because I am really enjoying her way of telling this amazing story. Awesome! Thank you! Midterms are tomorrow and this is a concept that I was having trouble with! I'd like to just say that your explanations are very helpful. Thank you! So glad i stumbled upon this website.